Importance of Uninsured Motorist Coverage in Georgia Is uninsured motorist coverage necessary? Attorney Jaret A. Spevak discusses the importance of uninsured motorist coverage in Georgia and how it protects you. Being involved in a car crash can be an extremely difficult and trying experience. Often, accident victims experience injuries that require serious medical care and a period of both physical and emotional recovery. They may have to miss work, adding to the financial stresses of their medical costs. Additionally, there are legal considerations to be made and property damage to address. These issues can feel overwhelming, and the situation can be made worse when the driver responsible for the accident does not have the state-required auto insurance. All Georgia drivers are required to carry a minimum amount of car insurance, but unfortunately not every motorist obeys the law. Georgia, like most states, mandates that drivers have auto insurance. These policies are required so that drivers are protected if an accident happens. Typically, drivers must have insurance to cover injury and property damage to other drivers and their vehicles. These coverages are known as bodily injury liability and property damage liability. If a driver fails to secure this insurance, the state can impose severe penalties, including fines and a loss of driving privileges. While these are the only two required types of coverage, insurance companies do offer a number of additional coverages that a driver can choose to purchase. One of these is insurance to protect against uninsured motorists. Uninsured motorist coverage protects you if you are involved in a crash with a driver who does not have insurance or does not have enough insurance to cover the bills associated with the severity of your injuries. It would also take effect if you are involved in a hit and run accident. This coverage is optional, but it is a good idea to have. Add-on insurance. Add-on uninsured motorist coverage would increase the monetary amounts available to you after an accident. You could collect both the amount of coverage the at-fault driver may carry (which may be nothing or simply not enough) plus the amount of uninsured motorist coverage you have selected. Reduced-by insurance. This is a more traditional uninsured motorist coverage. With this coverage, you would only be able to collect as much as the limit to the uninsured motorist insurance you have selected in total. Your policy and whatever amount the at-fault driver has to offer would not stack, as in the add-on insurance. The other driver’s policy amount would offset your own coverage. This may seem confusing, but a real life example would play out like this: Another driver fails to yield, crashes into your car, and causes $150,000 of damage. That driver’s liability insurance only covers up to $50,000, and you have purchased $100,000 of uninsured motorist coverage. With an add-on policy, you would be able to collect both the at-fault driver’s maximum amount and the maximum amount of your own uninsured motorist coverage, for a total of $150,000. This would cover the entirety of your damages from the accident. However, if you carry the reduced-by type of coverage, you would only be able to collect the at-fault driver’s $50,000 and an additional $50,000 from your own uninsured motorist policy, for a total of $100,000. This would leave you with a recovery that is $50,000 less than the amount of the damages you suffered in the accident. Add-on uninsured motorist coverage is slightly more expensive to purchase than reduced-by coverage, but it can provide you with a significantly larger monetary recovery should the time come to use it. Despite the state law that requires drivers to carry insurance, there are many people on the road who have no insurance or coverage that is so basic that it will be inadequate to cover any serious injuries sustained in an accident. 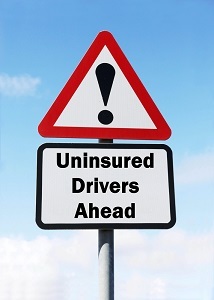 A 2014 study by the Insurance Information Institute found that in 2012, approximately 11 percent of Georgia drivers were uninsured. Additionally, the National Association of Insurance Commissioners states that one of out every eight drivers nationwide is uninsured. Unfortunately, these drivers are sharing our roads and the risks associated with them are real. After an accident and injury, the last thing a victim should have to worry about it is whether she can obtain the medical treatment she needs and how she will pay for that care. If you or someone you love has suffered injuries in a car accident with an uninsured driver, the experienced car accident lawyers at Rechtman & Spevak may be able to help. Take a moment to fill out our online contact form today. You’ll receive a prompt response from a member of our team who can help answer your questions and schedule a free, no-obligation consultation.